Zak Zinter‍ was in South Bend a couple of weeks ago and he already has plans set to take an official in a couple of months. 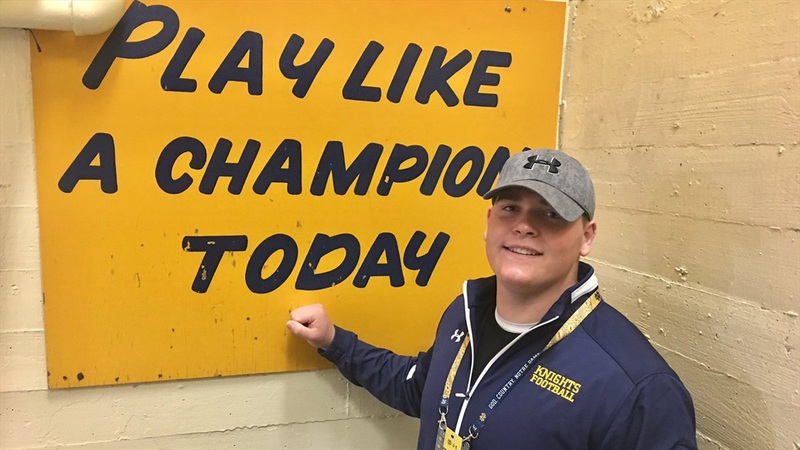 But the 2020 Massachusetts offensive lineman decided he wanted to get back and didn’t want to wait until the June visit he already has planned, so he’ll be in town for this weekend’s Blue-Gold Game. “Just want the opportunity to spend more time on campus with the coaches, players, learn more about the academic programs available and see the spring game,” Zinter told Irish Sports Daily. The 6-foot-6, 315-pounder was in town for the Ball State game back in September, so he knows what a true gameday environment is like in South Bend. “Just want to be back again and continue building a relationship,” he added of his reasons for returning. Zinter has remained in contact with Irish offensive line coach Jeff Quinn throughout the process. The Buckingham, Browne & Nichols star will be joined by his father and grandfather on this trip. Zinter’s offer sheet also includes schools like Ohio State, Michigan, Michigan State, Penn State, Nebraska, Miami, Tennessee, Northwestern, Duke, Boston College, Virginia and Yale among many others. But, as of now the Notre Dame official remains the only one he’s locked in.